Printables, worksheets and checklists, oh my! They are all the rage right now. You can find just about any kind of printable you could ever want by scrolling through Pinterest and it seems that every home management blogger or business has free or paid worksheets you can download. Pre-made printables are amazing because you don't have to do any work and your home organization gets to benefit from someone else's design. You can use them to keep chore lists, meal plans, recipes, password, household finances and anything else your mommy heart desires. But what about those times when you don't like the design of someone else's pre-made printable? Or the colors? Or the layout? Or the text? Or it just doesn't fit your particular lifestyle? It's time to make your own. And now the question becomes, "But, how? I'm not a designer and I don't know how to make my own pretty, colorful printables. I only know how to use Clipart in Word from 1999." That was my basic sentiment when I started getting into designing my own workbooks. Luckily, I was introduced to Canva, a design program used by over 10 million people to easily create their own designs, either for print or digital. While programs like Photoshop are far superior, there is a steep learning curve and it can be frustrating if you've never touched an Adobe product before. Canva is more user-friendly, especially for the beginner. Why keep writing about it when I made a video to walk you through exactly how to create your own printables and worksheets, with the exact colors, fonts and designs you want even if you have zero design background. Moms deserve to not only have managed homes, but have that management look cute, too. To follow along with the video or start your Canva journey, head over to www.canva.com. Even with the right printables and checklists, reluctant homemaker-itis can still seep in. 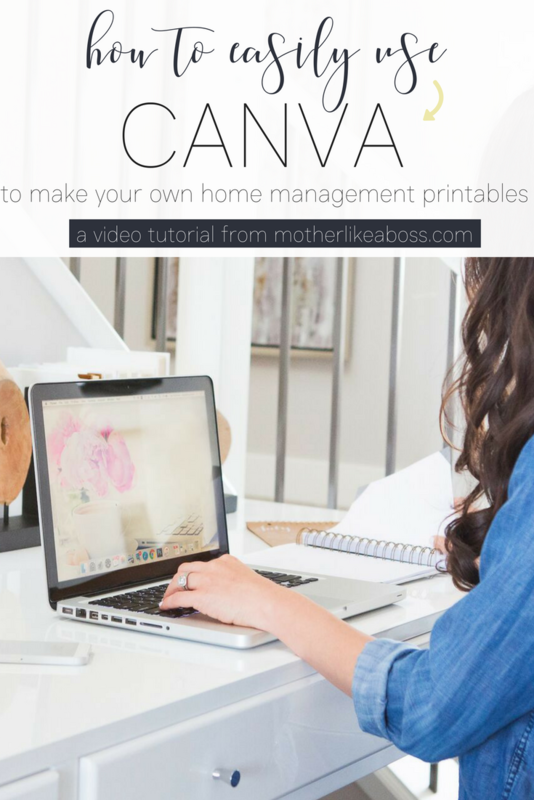 Sign up below to join The Mother Like a Boss Vault and gain free access to home management printables, worksheets, mini courses, audio lessons and more! This vault is your key to all things #homemakerish and it's totally free.